Diddy's ear for talent is unquestionable. After playing an instrumental role in the careers of Jodeci and Mary J. Blige, the Bad Boy founder went on to discover the Notorious B.I.G., Mase, 112 and Faith Evans. His newest signee may not fit the Bad Boy mold, but Diddy is excited nonetheless — so excited that he Skyped into "RapFix Live" while on vacation in Spain to chat it up with Sway about his newest artist, Machine Gun Kelly. 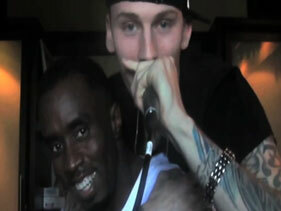 "Yes, I signed MGK," Diddy confirmed. "This kid, I think he's a star. He's one of the best live performers I've ever seen to come out in a minute." Influenced by DMX, Cleveland, Ohio's Machine Gun Kelly began battle-rapping around 2004 while he was still in high school. His passion grew from the corner ciphers to the studio, where he would lay tracks for his 2006 mixtape, Stamp of Approval. Back then, the MC (who got the Machine Gun part of his moniker because of his rapid-fire raps) was just getting his feet wet. In 2010, MGK would drop two tapes, 100 Words and Runnin' and his breakthrough Lace Up. From there, the energetic spitter would develop his following thanks to his spirited live performance. The hip-hop mogul marveled at the existing fanbase Kelly had before even signing the deal. "He has just such a movement, just hundreds and thousands of loyal fans that came from the place he came from in different parts of the country," Diddy gushed. "He wasn't always the coolest kid in school, and just the process of growing up and the problems that they all encounter, they relate to him in such a way." On the surface, MGK may not fit what many would perceive as the Bad Boy mold. He is a white, skinny, tatted-up kid from Cleveland who is influenced by punk music just as much as he is influenced by rap. For Combs, it's a non-issue. "One of the things as an executive and someone that runs a record company is that I change so much as far as my respect for artists whether they succeed or fail. I think it's important to empower the artist," he said. "He will not be changing for Bad Boy; he will not have a typical Bad Boy swag. He's not going to be popping champagne or driving around in Bentleys. He's gonna be him and true to himself. He has a lot of creative control in his project." Kelly, who recently graduated from sleeping on a futon to a mattress in his manager's mother's house, agrees. He assured his fans that he won't be changing his lifestyle very much. "We're kind of all about that 'I don't like to look better than my fans,' so maybe one day I'll change, but I pray to God I just stay the same," he said. "We had a bidding war before he came in, but Puff is Puff," MGK said. "Honestly, I really want to treasure this almost-famous stage as much as we can, while we still can. It's crazy, because Ohio is one thing; we have this great hometown love. We'll do 4,000 in one show, but then we just did Texas and it was probably 60 to 100 people, still doin' holes in the wall, and it's so cool." He won't be doing those venues much longer. MGK confirmed that he signed a two-album deal with Bad Boy and will be dropping his debut album, also called Lace Up, in the first quarter of 2012. "No push-backs with us, baby," he bragged. "Not happening. The fans are not allowing that to go down."